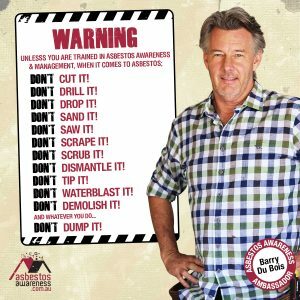 With 1 in every 3 Australian homes containing asbestos, Tradies and handymen who work on domestic properties are more likely to come across asbestos every day of their working life so it’s vital they learn to identify and manage asbestos safely. Even if you’ve worked with asbestos before and not been concerned about managing it safely, it’s time to TAKE THE WARNINGS SERIOUSLY and learn where asbestos might be located on the job and how to manage it safely! Many tradespersons and workers including labourers and handymen can expect to encounter products made from asbestos-containing materials (ACM) in their day-to-day work. And while regulations on asbestos management can vary in each State and Territory, we have developed some guidelines to help Tradies and those working on domestic properties manage asbestos safely to minimise the risks to their health and the health of colleagues, families and bystanders.